Through her training, focus groups, and insightful “field trips,” Myra has been helping people develop their emotional intelligence to improve the customer experience for the past 15 years. In this presentation, Myra brings her field work to the stage and introduces Four keys to Developing Emotional Intelligence: Empathic Listening, Mastering the Little Things, Proactive Conflict Management, and Meeting Un-expressed Needs. The result of this talk is an audience prepared to improve workplace relationships with colleagues and customers through listening with the intent to understand, meeting needs others don’t explicitly express, and proactively resolving conflicts. Plus, they’ll learn how to master the little things, so they consistently deliver exceptional customer experiences. The “man in desert” approach to meeting needs that aren’t even expressed, so they develop a knack for meeting needs customers and colleagues don’t even express! The highest level of listening – empathetic listening. Your employees learn to put themselves in someone else’s shoes and understand their situation from their perspective, so they improve communication in workgroups and with customers. An understanding of why it’s the little things that make the difference – from the warm welcome to the fond farewell, so that they don’t miss an opportunity to delight and make emotional connections at any touch point. Engage conflict productively, so they handle issues with customers and fellow employees with confidence, ease, and in such a way that maintains the esteem of the other person and reaches a solution that works for all parties. “Myra’s keynote session was everything I was hoping for and then some. She left our group energized and excited to get back to their stores and WOW their customers. Our managers have already started to put practices in place to take their customer interactions to the next level. Her perspective and message were easy to follow, and she gave actionable items that will help our organization for years to come. She truly understands what it takes to make lasting emotional connections with customers and has a wonderfully effective way of delivering it. 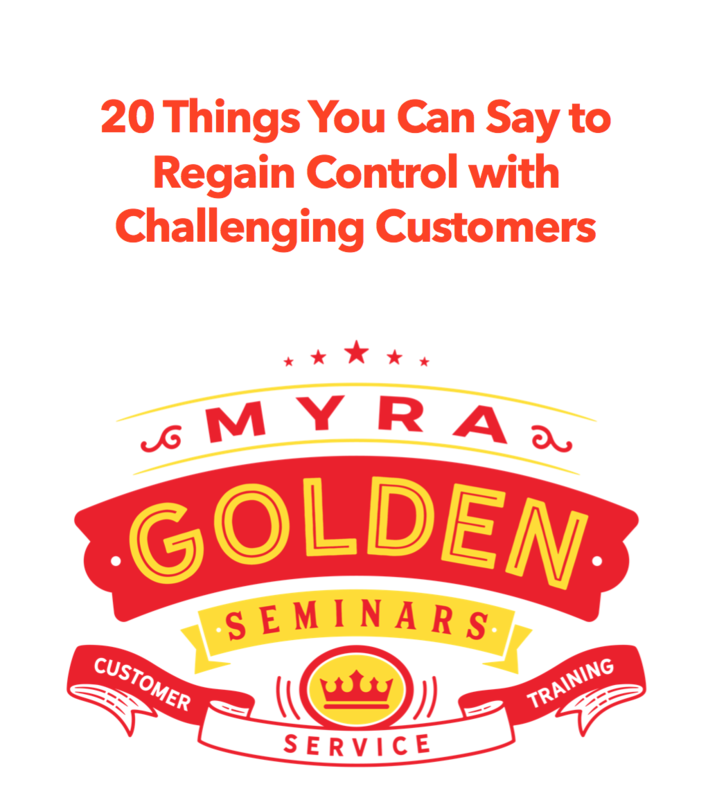 When I first contacted Myra, I told her that I wanted a program that was tailored to our unique business and the audience (store managers) that would be in attendance. She assured me that she was the right person for the job and I have to say, she was right. She worked with us closely leading up to our convention and delivered on all her promises.